Outsourcing is a cyclical business - when economies nose-dive, organizations batten down the hatches and wait for the uncertainty to clear, before making decisions that are longer-term in nature and potentially disruptive to the business. Recessions drive short-term behaviors, namely immediate cost-cutting, re-orgs and layoffs. Hence, shaking up the finance, HR and procurement functions with complex, stressful outsourcing initiatives could well detract from the short-term tactical measures to ride-out the economic misery. Having come through the worst Recession since the bubonic plague, it's little surprise that much of the outsourcing energy dissipated between 2008 and 2010. Lots of low-risk application development and support work was moved to low-cost providers during this time, as it fitted the "cost-out-quickly with minimal disruption" mentality of many organizations. Consequently, many enterprises still operate their core general and administrative work much the same way they've been doing for the last decade or more, and most business function leaders know they have to change. Our State of Outsourcing 2011 study of 1,335 industry stakeholders, conducted with the Outsourcing Unit at the London School of Economics and supported by our friends at SIG, points to a marked turnaround in outsourcing intentions as global economies reach a period of sustained (albeit limping) recovery. For many organizations today, clearly the short-term counter-recessionary measures have been executed through to fruition, leaving business function leaders under renewed pressure to seek out new operational strategies for driving out cost and improving global effectiveness. Well over half of enterprises today are outsourcing a proportion of their apps and infrastructure, and the overwhelming majority (58%) are adding scope to their engagements. Clearly, this is a maturing and (dare we say it) commodotizing marketplace, where buyers are getting increasingly experienced and looking to squeeze more out of their existing service provider portfolios and further reduce their onshore staff numbers. As Part 2 illustrates, many firms still have plenty of IT support still inhouse or in shared services. We expect a heavy polarization by the leading service providers to soak up this high-end enterprise demand, while the less-profitable scraps in the middle market will get fed to the lower-tier providers, and those slipping top tier providers now struggling to maintain their enterprise presence. Procurement BPO: Finally, Procurement BPO is on the table, with 18% of organizations seeking their first forays into an outsourced model over the next 12 months. Organizations are coming off the Recession knowing they have to globalize their procurement processes and leverage the indirect sourcing competences of providers to tighten-up the cash flow. Moreover, providers are aggressively pushing gainshare, risk-sharing proposals at buyers in order to develop scale and category expertise across procurement BPO functions. Procurement BPO doesn't bode too well with the labor arbitrate-only model - most procurement departments have already been cut to the bone - and merely lumping messy procurement work offshore isn't, by itself, going to deliver benefits that are going to make this a worthwhile experience. However, there is lots of money to be saved (or gained) when you use more effective procurement technology and have access to category experts. With such a large number of buyers already bedding down their F&A engagements, procurement is the natural next step for may organizations. Finance & Accounting BPO: As we discussed during our recent F&A market analysis, F&A BPO has emerged aggressively after being back-burnered considerably during the Recession. With 17% of enterprises expecting a first-time move into F&A over the next year, we can anticipate several new engagements to come to fruition, with a projected market growth of 15%. However, we would also add that 85% of F&A discussions currently on the table are being sole-sourced with limited (if any) advisor presence, which makes it challenging for providers to get their clients over the line to take the plunge. There isn't a lot of education and experience in the market for buyers to get the discipline and data they need to move into an engagement via a sole-source, and we anticipate that many of these engagements will take a lot longer than a year to get finalized. And many will likely never happen. Human Resources Outsourcing: There are two dynamics driving a healthy growth in the HRO space - the desire from many enterprises to globalize their payrolls, and the need to help with the new compliance and regulatory measures being introduced by ObamaCare. Very few enterprises are still looking at multi-process HR BPO strategies, instead electing to look at single process engagements, often with a diverse mix of providers. We are also seeing increased interest in recruitment process services, as many business seek more flexible staffing models and increased proportions of contingent workers. Other process areas: "Traditional" BPO areas, such as call center and document and print operations, are clearly on an upswing as business volumes improve and buyers need more support. And with many large enterprise already having existing service contracts in-place, increasing delivery volume and scope is already underway. We'll dig deeper into the nuances of these more traditional markets in Part 4, coming to a LCD near you very soon. Industry-specific processes are currently dominated by several high-end insurance companies and banks with a lot of activity in areas such as claims processing and management, compliance support, payments processing and capital markets services. In addition, we are seeing increased interest from some of the big pharma, in areas such as clinical data management and pharmacovigilance services. New BPO markets, such as LPO, marketing operations and analytics are also featuring as areas of planned investment from buyers. The outsourcing market is hotter than it's ever been from an interest and activity perspective. There is barely an unemployed or benched sourcing advisor to be found, and providers are hunting like dogs for new sales reps to develop their bulging pipelines. However, lots of bubble and fizz doesn't always translate into long-term action. As we discussed during parts 1 and 2, buyers struggle to get a broader picture of outsourcing beyond cost-reduction, and many distrust the providers to mitigate their risk. Moreover, many buyers clearly struggle to get to a decision-point about such a sensitive and potential disruptive phenomenon as outsourcing. We predict that existing buyers will follow-through with their intentions to increase scope of existing engagements, but many of those intending to outsource a function for the first time, will either fail to make decisions internally, or their expectations with regards cost-savings, are not going to be met - especially the more resource-constrained buyers in the mid-market. We'll see most activity over the next year with the experienced enterprise-level buyers, while the mid-market takes time to digest its options and seek out providers that can really deliver a business case that makes outsourcing compelling enough for them. Very interesting data - what a great engine you folks have built! It's such a dichotomy that the real measure to drive out cost are tackled on an upswing - and this data proves this. 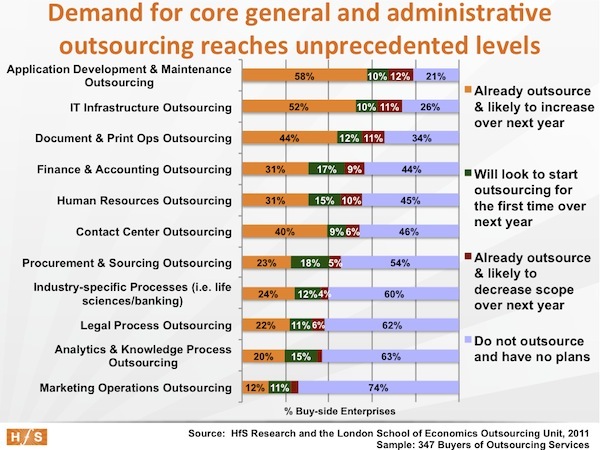 I'm just skeptical that many buyers have realistic expectations with many areas of outsourcing. While sales reps will pitch the big savings, they often have to invest in a lot of operational analysis to find out that their processes are simply too complex to move, or there are far too many "soft" as opposed to "hard" savings.